Our family tree decorated with ornaments collected and made over the years is in our family room... thank you for stopping by... and don't forget... "He sees you when you're sleeping, he knows when you're awake... he knows if you've been bad or good... so be good for goodness sake!" ENJOY the JOY of the Season!!! I know it is a comfortable chair... 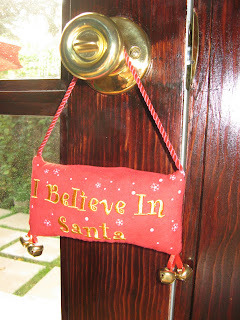 BUT... off you go to visit others participating in The Inspired Room' s Fridays: Holiday Linky Love!!! 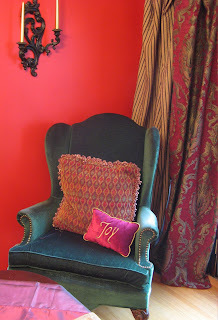 Merci Beaucoup to Julia of Hooked on Houses for having a Holiday Tour Party!!!! Thanks for the visit...if you notice the snowmen have left with me. You can visit them anytime at my house. 3 trees! Crazy! I don't think that I'm even going to have one......o, but we do a miniature fake one!? Very pretty decor. Thanks for sharing. very pretty house...great staircase for decorating...I love night time lighting! Happy Holidays! It's beautiful Fifi! I enjoyed everything! Ohhh, I love it. Everything looks so cozy and warm. Everything looks exquisite. I love your stairway. And, I am trying very hard to be good. Sometimes it is quite difficult. I love the pictures of your house! just beautiful!! We're doing are best to be good! 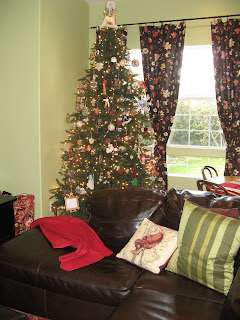 Looks like everything is Christmas - ready....Wanna come to our houses? How pretty!! It looks great and very festive...can I come over for Christmas? Fifi it's amazing...I mean AMAZING. I love the front entry with the staircase and how creative to decorate the music room tree in music themed ornaments...I wouldn't have put it past you; your so talented! I LOVE your house first of all! And your Xmas decor is wonderful. Nice job! I LOVE XMAS time! Oh So lovely! I need to get a jump on my Christmas decorating! I love your style! Your house looks beautiful. I love that staircase and that music room. It's all so Romantic looking. 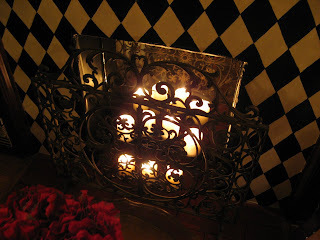 Seriously, that fireplace is incredible...did you paint it or is it tiled! What a great idea! Your house looks beautiful...the entry way is magnificent! WHat a festive looking home you have! Thank you so much for sharing!! I love you paintings too! I've seen them posted on several other blogs- my you have a gift!! Sure puts me in a decorating mood!! Putting the tre up this weekend! Oooh, I love your fireplace! Your home looks gorgeous. Your home looks gorgeous, Fifi!! Your home is absolutely stunning & I still can't get over that fireplace! Happy Holidays! Sorry I missed the event Melissa was doing...She sure is a sweetie! Your beautiful home looks so warm & inviting dear Fifi, with all your Christmas decorations up. I'm still loving your black & white firebox something fearful!! You have a beautiful home, Fifi! Love all your decorations! 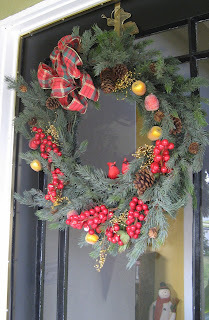 Your home just look gorgeous with those holiday home decors. Everything looks fantastic! 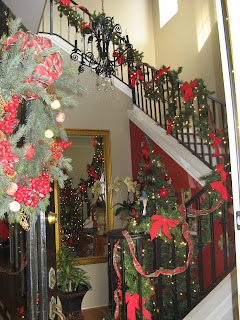 Especially love the garlands along your bannister -- just lovely! I love your Christmas decorations! 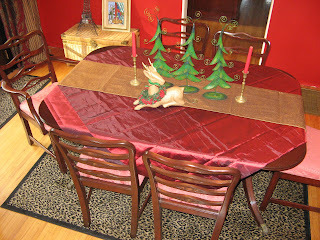 We have yet to decorate, it is on the schedule for the weekend. Thanks for the lovely inspiration. It's a WINTER WONDERFUL! AMAZING and BEAUTIFUL!!! A FEW touches?! Mon Dieu...can you please come to my house and add a few touches? :-) Your house looks ammmmaaazzziingg. Sorry I've been absent...your house is beautiful and looks so warm and inviting. 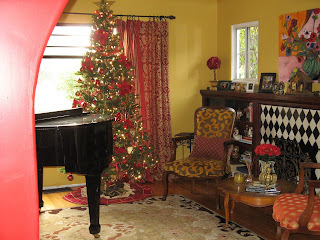 I'd love to go to a holiday party at your place....the perfect spot for a glass of cheery champagnes! wow! Look at your pretty entryway and that tree at the bottom of the stairs. So pretty. Thank you for sharing. please share your tree avec kittens again at some point- has to be one of my favorite holiday pictures! Your use of color is fabulous. (Of course it is -- you are an artist!) Your Christmas decorations work perfectly.